Attorney Paul Rice of the Rice & Rose Law Firm was invited to the Regional Collaborative Meeting of the Family Law Courts for the 7th, 18th and 19th Judical Circuits. Mr. Rice attended the event which was held at the Moore Justice Center in Viera, Florida on March 23, 2012. Family Law Judges, Family Court Administration staff and key community partners discussed various issues and challenges which Family Law Judges, clerks and administrators face and how to improve the way the system serves families and children. 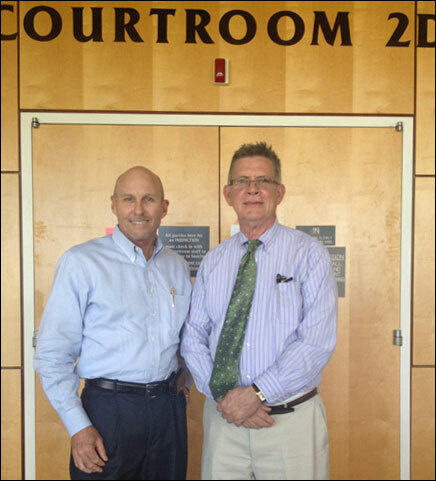 Mr. Rice, on left, is shown here with Bob Sterner, who is the Family Court Services Manager for the Seventh Judicial Circuit. The Seventh Circuit encompasses Volusia, Flagler, Putnam and St. Johns Counties.